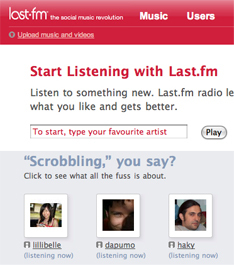 CBS Corp. announced its acquisition of Last.fm for $280 million. The social network, organized around musical tastes, leveraging each user’s musical profile to make personalised recommendations, connect users who share similar tastes, provide custom radio streams, among others. The company claims more than 15 million monthly users, including more than 4 million in the U.S.
“Last.fm is one of the most well-established, fastest-growing online community networks out there. Their demographics also play perfectly to CBS’ goal to attract younger viewers and listeners,” CBS Chief Executive Leslie Moonves said.